DRZ400SM - just got a FCR39, pics and smorgasbord of bite size questions! Ok, Read a lot of articles prior to posting. Have a DRZ400SM and got a cheap FCR39+throttle from a KTM. Have open SSW exhaust. 3x3 mod. Stock air filter (!?). Have ordered all stuff needed to mount it plus an EMN needle and a long adjustment screw. Run at 10-25 celsius/50-77 fahrenheit, at sea level. Opened new carb to check. Dude I'm so confused compared to mikuni. Jet - Starter size 85 - keep? Jet - Pilot 45 - keep I presume? Jet - Main air 100 - keep I presume? Jet - Pilot air NONE - keep as is I presume? I seem to be missing choke which used to be wire operated - what to do? Def need choke on current mikuni. Preferring knob I think. TPS connector - leave unplugged I presume? ...previous owner broke one of the sled wheels. Replaced with 18.5 mm diameter wheel instead of 18.8 mm. Also differs with plastic hub and fall off easily, other 3 wheels have metal hubs/bearings and don't come off (easily at least). The too small sled wheel make the sled scrape a bit towards the carb housing, making a little scratchy noise (which is why I opened to check). Just ignore or replace wheel with what from where? Grease the wheels/sled housing with what? Accelerator pump O-ring mod not done. 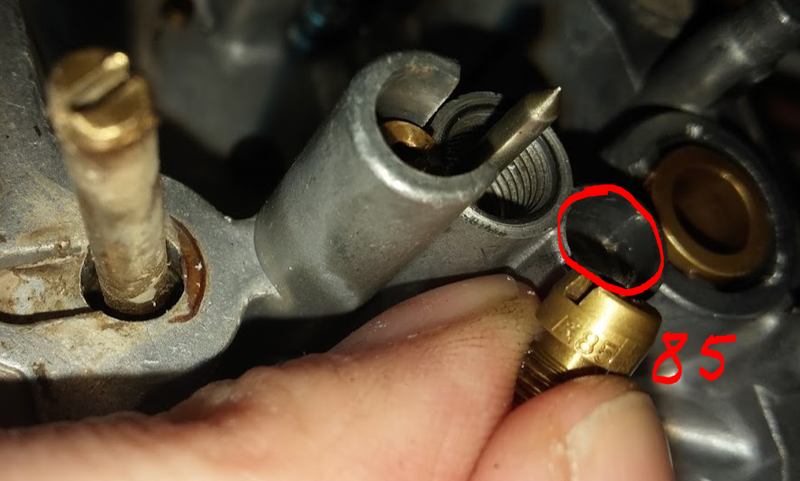 I would hate bog - is oring needed for sure or can I retrofit if needed without removing carb? Cant source the darn orings. Jet - Accelerator pump leak jet is either clogged or just a plug. Keep? Jet - Main air 100 - keep I presume?-----Looking into the intake of the carb, the air port in the center is the main air jet. To the left is the pilot air jet. Main air is 200 (nearly universal). Pilot air is 100 (again nearly universal. So I'm thinking you have a 100 pilot air and no main air jet. Coud be the main air jet is missing or could be that carb has a drilled passage and no replaceaable main air jet. 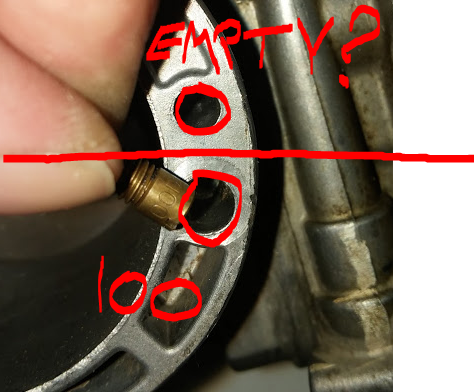 Are ther threads in the hole? I seem to be missing choke which used to be wire operated - what to do? Def need choke on current mikuni. Preferring knob I think.----- You might no need a choke. I do not know what it is you have circled in the picture with the choke. You can buy choke parts. A few pictures not so close up would help orient me. Especially one showing the choke. It is supposed to be mx version, attached images as requested. Keep current unknown needle? I can measure tip half, but screw dont seem to come off. Will check thread status in holes of intake ring. Yes, it is the MX body. There are many variations on the basic FCR carb. That carb has a non-removeable intake bell. Generally less desirable. You will have to figure out how to adapt the air intake boot to the carb. The knob is black with no symbols, single hole in the well. The other wire operated valve is rusted shut, the spring is rusted stuck. Attached image. What do you think - do I have choke? Do I need to care about the gunk in the other hole, ie. clean out and seal the harness with rtv silicone? Regarding Air jets above - my 100 jet is definitely supposed to go into the left larger hole looking into the intake, ie. Pilot Air Jet if I understand correctly. The right of the two holes seem to have no threads, but I cannot tell for sure (too deep). Should I order a 200 Main Air Jet, and what is the procedure if I can fit it? What is the procedure if I can not fit it? The top port is the hot start. The choke is below it. Excellent!! Good news indeed! You know anything about the air jets me and noble were talking about lastly? I'm not sure if the main air passage has a jet or not. 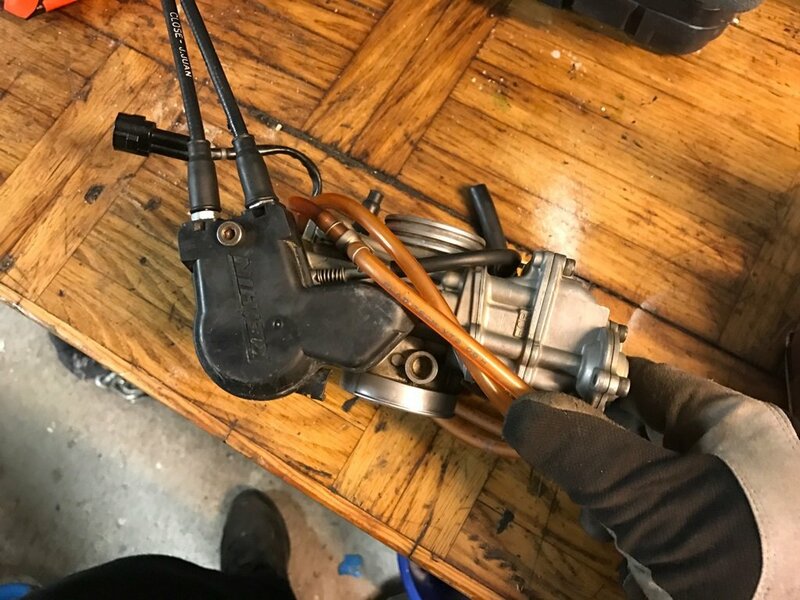 Do you know the model of KTM the carburetor originated? FCR MX 39 from a KTM. The main air jet passage doesn't have a jet and has a fixed size of 200. I think it was a 250cc, if significant i can look through mails. Cool thanks, saved me some headache. So keep 100 pilot air jet and be happy? Thanks frank, good advertising from your side. I noticed the other day by coincidence, that you stock the wheel we mentioned previously, do you possibly have a caliper to make diameter measurement - 18,8 or 18,5 mm? It's 18.5 mm. It's usually the body that gets worn out, the wheels keep their original OD pretty long.